If you follow me on Twitter, Snapchat or Periscope (all @gabpacifico), you'll know that last week was a seriously hectic one at that. I plan conferences for my day job, and last week we had a huge national conference take place in the city. It was basically seven days of no sleep, binge eating, and just running myself ragged. My skin was definitely feeling the effects of the stale hotel room air, and the extreme dryness in the convention centre. Just before I headed off to the conference I received a lovely package from NeoStrata. I met up with them during Toronto Fashion Week and they gave me a bit of a low down about their most loved products. Since winter does a number on my skin, I was very excited to try something new and was so happy when these arrived just before I left. 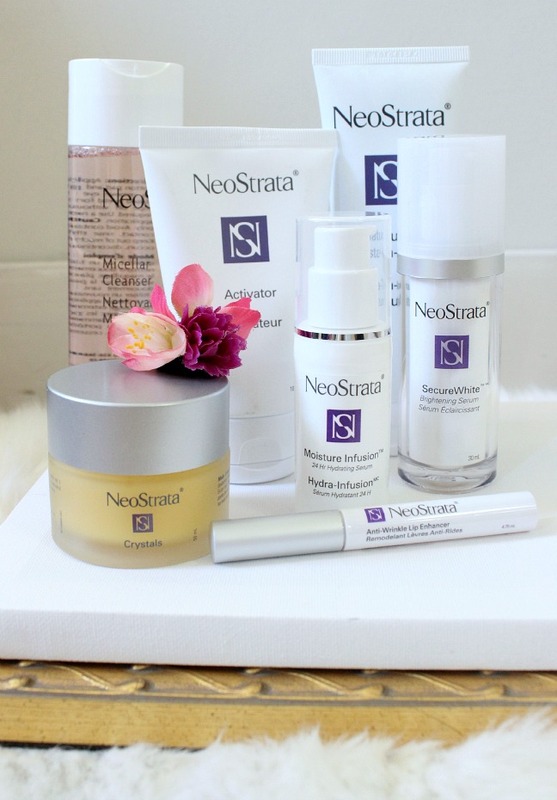 NeoStrata is a leading cosmeceutial brand in Canada; they offer a variety of products for all different skin types. I was most excited to try out the Skin Resurfacing Duo (winner of Elle's Beauty Prize in 2014). It's a two step exfoliator that revitalizes the skin and leaves you feeling so fresh and radiant. The crystals, which give off a sweet lemony scent, are massaged into the skin, then without rinsing you coat the crystals with the activator. The activator is more liquid based, and doesn't smell as delicious but it definitely firms up the skin. You then wash both off and are left with deeply cleansed, radiant skin. Skin was a-glowin'! This duo has quickly become a part of my morning routine. It wakes me up, washes deep down and leaves my skin oh so soft and did I mention radiating?? The other product that I have officially added to my morning routine is the Moisture Infusion 24 Hour Hydrating Serum. My face has a serious tendency to dry out throughout the day, and the thought of spending a week inside a convention centre had me so worried about what the state of my skin would be by the end of the week. I was shocked at how well this cream locked in moisture. It leaves you feeling so hydrated and velvety. The other products I am just starting to add into my beauty routine, like the Micellar Cleanser, which is a great alternate to make-up remover for those nights when you can't be bothered to wash your face (you don't need to rinse it off!). Or the Anti-Wrinkle Lip Enhancer, which leaves your lips feeling velvety soft and adds a natural plumpness. I'll definitely be trying out the Natural Tan Enhancer in the upcoming weeks as I prepare for an upcoming trip to Palm Springs (officially taking recommendations as of now, since I can finally think about things other than work!!). 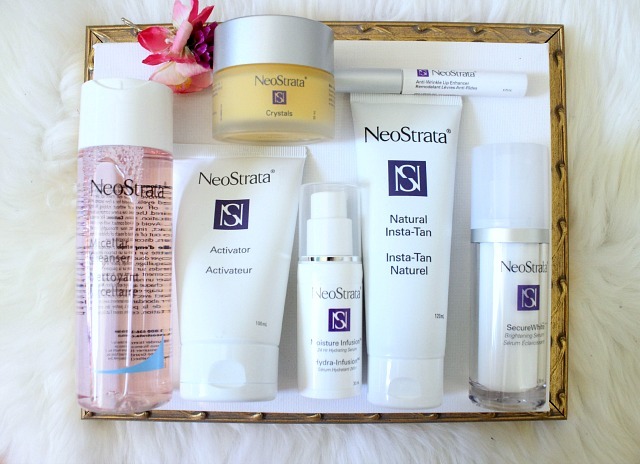 Thank you to NeoStrata for elevating my skin care routine! I am so glad I have found a few new amazing products to get me through the winter! Try them out for yourself. Do you have any skin-care products you love for the winter? I'd love to hear your tips! NeoStrata provided me with their products with no expectations or request for review; these opinions are my own.